Take shelter in this natural reserve and enjoy being in harmony with nature. 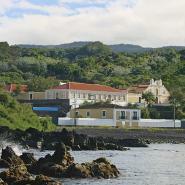 The Quinta das Mercês is situated on Terceira island in the Azores archipelago, nestled in the Brazil mountain natural reserve, between the ocean, gardens and a dense area of Atlantic forest. Built in the 18th century, in keeping with typical manor architecture, the farm’s large manor house is today, after undergoing an ambitious renewal and refurbishment project, a charming hotel. In its interior the common areas and the rooms are wide and comfortable, decorated in a markedly classical style. Some of the rooms offer a small private garden and others a tranquil sea view. The external leisure areas, the result of carefully designed landscape architecture, are harmoniously implanted into the Quinta’s surrounding gardens whilst maintaining the original structure of the land. Several sports are at your disposal. Enjoy cycling, play tennis matches or train your putting before heading out to the island’s golf course. The privileged connection to the sea also allows the possibility of canoeing and fishing, or even to venture into diving and spearfishing in the midst of the Atlantic Ocean. Whilst staying at Quinta das Mercês be sure to visit Angra do Heroísmo, a World Heritage site. Quinta das Mercês is situated in the parish of São Mateus, near the National Road that surrounds the island by its shore, at 1,6 Km of Angra do Heroísmo and 22 Km of the Lages Airport and the Commercial Port. "We thoroughly enjoyed our time there and the owners made us very welcome in to their home. The service was superb, and the staff was pleasant and efficient, nothing was too much trouble. I would recommend this Quinta to anyone."